Food and beverage vendors Red Frog Catering and Two Brothers Coffee Roasters will be at the Open House to provide snacks, drinks and lunches. Portable restrooms, hand washing stations, nursing stations and diaper changing areas will be available on site. We will have t-shirts and other Fermilab-branded items on sale at the Open House. Proceeds go to the Fermilab Friends for Science Education. A lost-and-found station will be established at the laboratory’s main office building, Wilson Hall, during the Open House. Shuttle buses are provided to get you around the Fermilab site. Please allow 30 minutes for bus transportation from point to point. No cars, trucks, motorcycles or bicycles will be allowed to drive to other locations on the Fermilab site. Bicycling across the Fermilab site will not be allowed during the day of the Open House. However, visitors are invited to ride their bicycles to the site at the Pine Street (west) and Batavia Road (east) entrances. Bicycle racks will be available close to the Lederman Science Center (west entrance) and at the welcome area (east entrance). Cyclists will be directed to park in one of these areas. 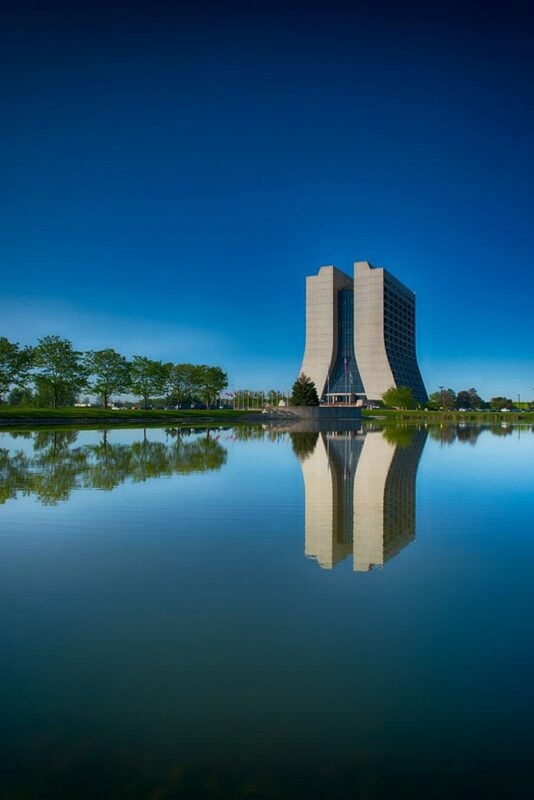 Fermilab welcomes all members of the public to participate in our Open House. Most event spaces and activities will be stroller- and wheelchair-accessible. Other power-driven mobility devices and service animals may be used by individuals with mobility disabilities. ADA parking and restrooms will be available throughout the site. Families and individuals with mobility, hearing or visual impairment concerns may contact Mario Lucero at 630-840-4630 or mlucero@fnal.gov. ASL interpretation will be available upon request. Bags will be searched upon entering Fermilab grounds. Firearms, knives, explosives, incendiary devices, ammunition, alcohol, narcotics, drones, grilling, open flames and toy weapons are not allowed on the Fermilab site. Pets are not allowed on the Fermilab site on the day of the Open House. While you may ride your bicycle to the Fermilab site entrances, bicycles will not be allowed across the site during the Open House. Cyclists will be directed to park in one of the designated areas. Avoid areas that are not open to the public. These prohibited areas include any areas not listed in the program of events, any areas marked Authorized Personnel Only, and the Fermilab Village, close to the east entrance of the laboratory site. Fermilab is a national accelerator research laboratory, and part of our work involves hazards you wouldn’t normally encounter. To convey safety information to Fermilab employees and users and also to stay in compliance with our regulatory agencies’ requirements, we post various safety signs, including radioactive material area, magnetic fields, radio-frequency and oxygen deficiency hazard (ODH). During your time at Fermilab’s Open House, you may see these safety signs. All of the tour areas you will visit have been reviewed prior to this tour and were found to be safe. In a safety or medical emergency, call 630-840-3131. Need in-person help? Notify someone in an orange shirt and hat with the Fermilab logo. If the National Weather service announces a severe weather warning for the Fermilab area, the fire chief will provide additional information to determine appropriate actions. For example, for a severe thunderstorm with lightning, visitors will be moved indoors to wait out the storm. If a tornado may develop in the area, Fermilab will execute the evacuation process described below. In case of an evacuation, all event staff will direct visitors to the buses for immediate routing to the parking areas. Once in your car, you will be directed out through Eola Gate, Batavia Road or Wilson Street. Visitors who came to the site on bicycle will have to decide if there is enough time for them to safely leave. If not, please contact a nearby event staff person for instructions. In case of a fire, please evacuate the building immediately. Event staff will direct you to an assembly area that will ensure all personnel are out of the way when the Fermilab Fire Department responds to the emergency. Visitors and event staff are to stay in the assembly area until the incident commander has cleared the scene. In case of a medical emergency, the Fermilab Fire Department is prepared to respond. If you or someone near you is experiencing a medical emergency, please notify a nearby staff person in an orange shirt and logo hat to call for emergency medical response. Four first-aid tents will be situated near or inside each food tent. To be prepared for the case of a lost child, choose a designated meeting spot and discuss it with your child. If you do lose a child or notice a child is lost, notify a Fermilab staff member wearing an orange shirt and Fermilab logo hat. We will communicate to reconnect the missing child with his or her guardian. At Fermilab we make every effort to integrate environmental consideration in everything we do. Throughout our 50-year history we have set standards and goals to become more energy-efficient and environmentally friendly. We have done this by avoiding harm to cultural resources and by protecting species, natural habitats and ecologically sensitive areas. In addition, Fermilab has also minimized emissions and effluents by employing pollution prevention and waste reduction practices. For example, all of our Open House food containers will be compostable. Please celebrate this tradition on Sept. 23 by enjoying the beautiful grounds and by placing all trash and recyclables into the appropriate containers.